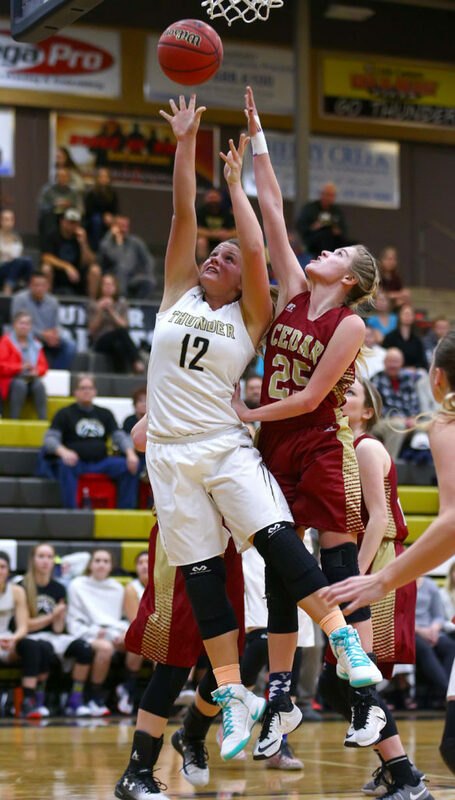 The rematch between Cedar and Desert Hills to kickoff the second half of Region 9 play was anticlimactic as the Lady Thunder’s half court trap pressure turned the game one-sided early. Desert Hills had a healthy 30-11 lead at halftime. 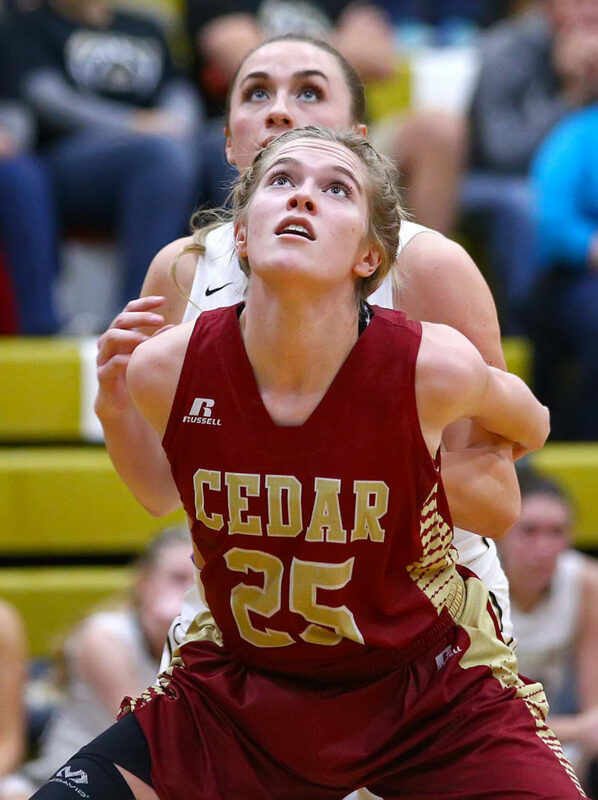 Cedar made a run in the third, but foul trouble eventually gave the Thunder the momentum again at the end and they finished the game with the same lead they had at the half, 55-36. Former Lady Red Morgan Myers wreaked the most havoc with four steals and eight deflections. Most of those came in the first half. After grabbing a 13-6 lead after one, the Thunder expanded the lead even further in the second. 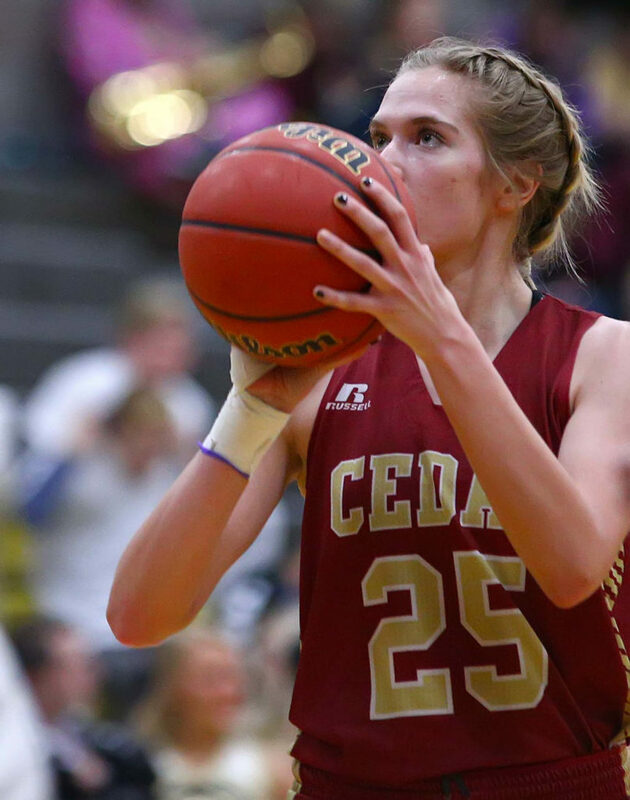 Cedar did not reach double-digit scoring until Dream Weaver’s jumper with 3:30 left in the half. By that time, the score was 26-10. Ashley Beckstrand hit one of two free throws, then tossed in a 3-pointer with less than a minute to play for the 30-10 lead. Maisie Elison hit one of two free throws to get to the halftime score 30-11. Beginning the third, it looked as though Coach Elison had made effective adjustments in the locker room. The Lady Reds went on an 11-2 run. Carley Davis scored five of those points. Her first basket came on a coast-to-coast layup. Moments later, she took an excellent feed from Dream Weaver for the easy basket. Lindsey Robinson’s jumper at the 1:45 mark pulled the score to 32-24. Desert Hills coach Ron Denos called timeout. 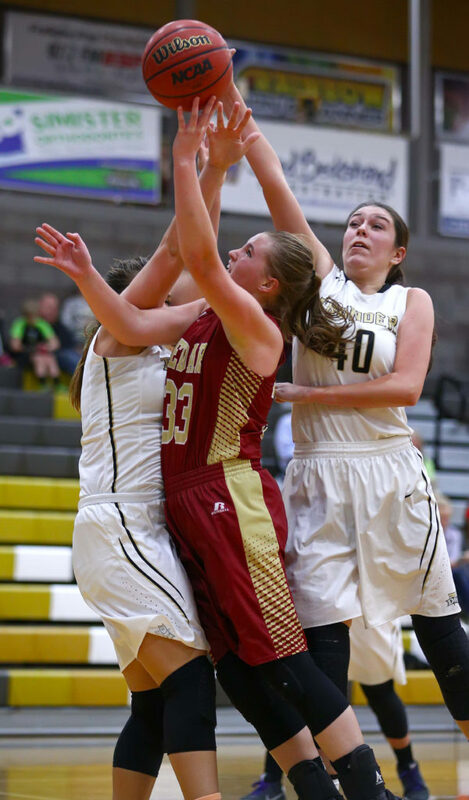 The strategy paid off as Desert Hills scored the last five points of the quarter. Myers’ layup with 10 seconds on the clock gave the Thunder a 37-24 lead. 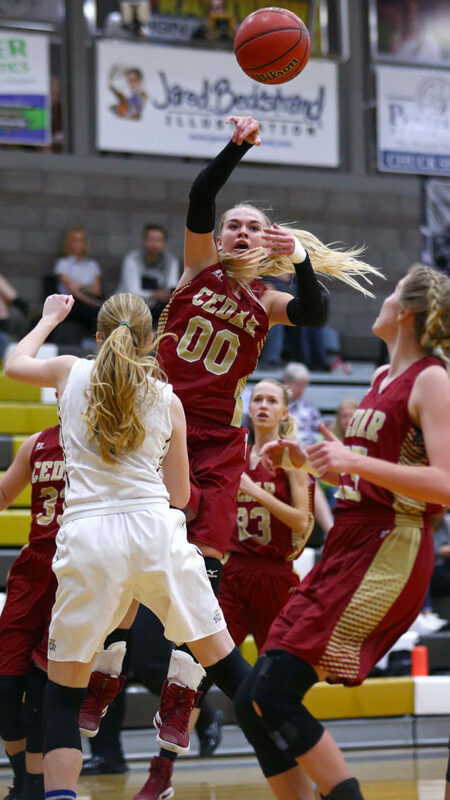 In the fourth, the Lady Reds kept with Desert Hills basket for basket, but could not get the lead back into single digits. With four minutes remaining, Davis fouled out. Dream Weaver, who had gone to the bench earlier with her fourth foul, came in for Davis. It was 41-29 at that point and the Thunder closed the game with a 14-5 run. Most of the damage came from Beckstrand and Jess Mathis. Another coast-to-coast layup by Myers closed the game out 55-36. The Thunder were led by Beckstrand with 19 points. 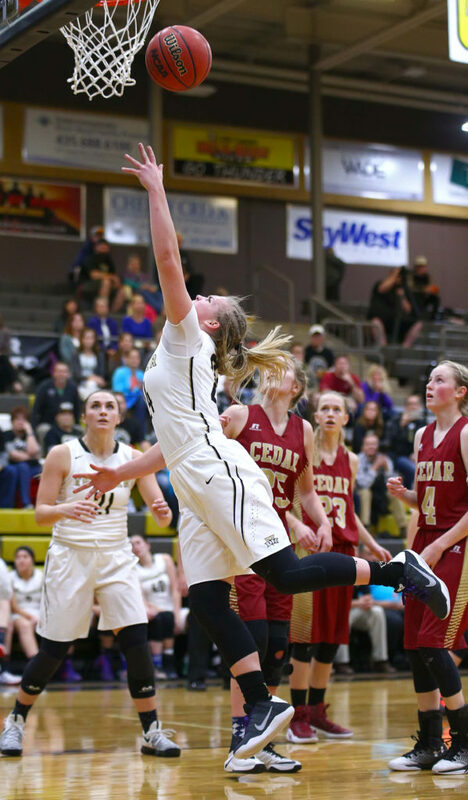 Desert Hills had five other players that scored between 6-10 points. Mathis had 10. Myers scored eight. Taylor Salisbury, Madison Clark and Elly Williams all had six apiece. Williams also led the team with six rebounds. For Cedar, Davis led the way with 10 points. Robinson scored eight. Dream Weaver scored six and Maisie Elison scored five. Elison led the team with 12 rebounds. Davis had a game-high of four blocks. 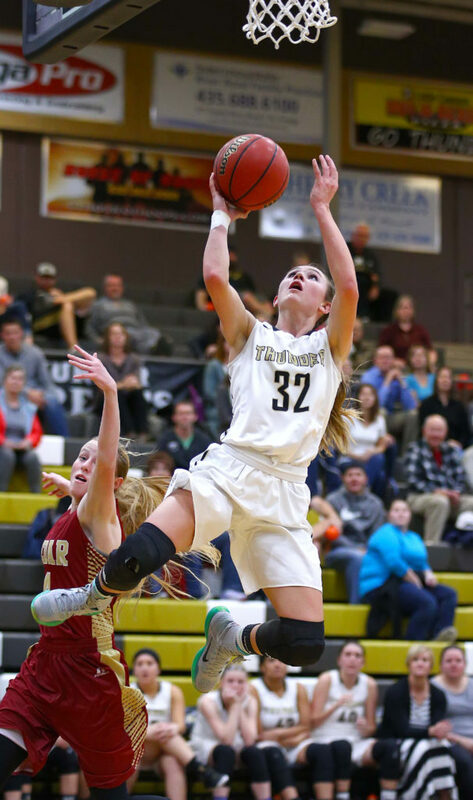 Desert Hills moves to 5-1 in Region 9 and 13-3 overall. The Lady Thunder travel to Dixie on Tuesday night. Cedar falls to 3-3 in region play and 12-5 overall. The Lady Reds will travel to Snow Canyon next week. The Lady Tigers took sole possession of second place in Region 9 with their win over visiting Dixie. Hurricane jumped on the Flyers early, taking a 13-3 first-quarter lead. The Tigers built on that in the third quarter, outscoring the Lady Flyers 20-7. Going into the final stanza, the Tiger lead was 43-23. Dixie closed strong in the fourth, but the deficit was too high to overcome. Jayden Langford led Hurricane with 18 points. 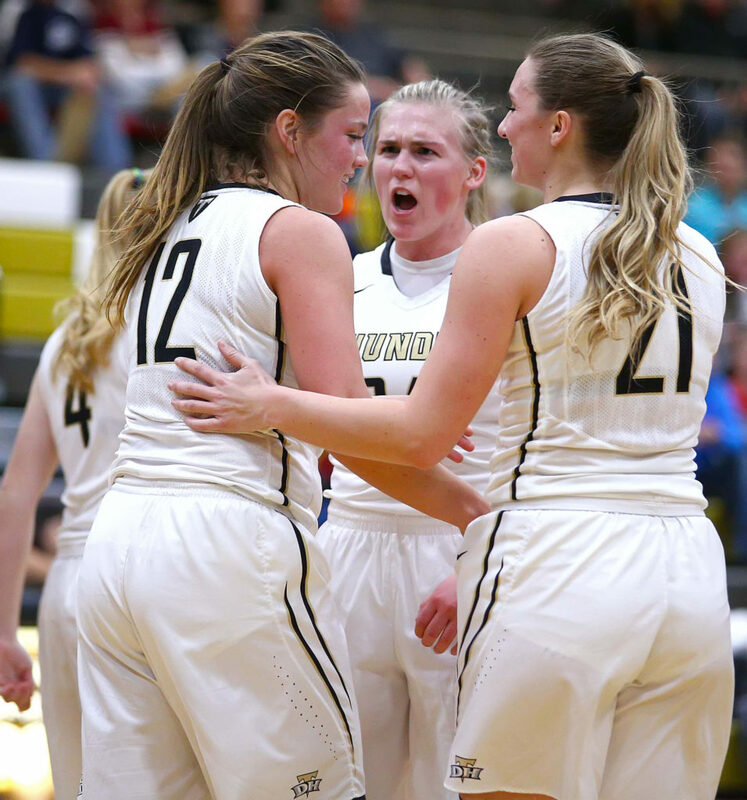 She was joined in double figures by Madi Hirschi (11) and Alexa Christensen (10). Hailey Homer scored seven. 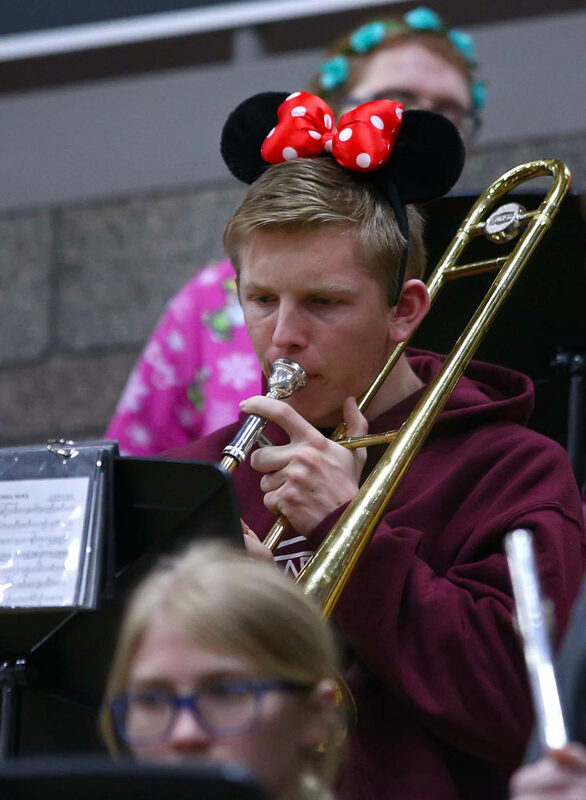 Christensen also led the team with seven rebounds. Hirschi had four assists. Kylee Stevens had four steals and shut down Dixie’s leading scorer, Kelsea Barker, holding her to six points. Dixie’s Grace Killian led all players with 22 points. Gaybrielle Hendricks scored five. Hurricane improves to 4-2 in region and 11-6 overall. The Lady Tigers will travel to Pine View on Tuesday. Dixie falls to 1-5 and 5-10 overall. 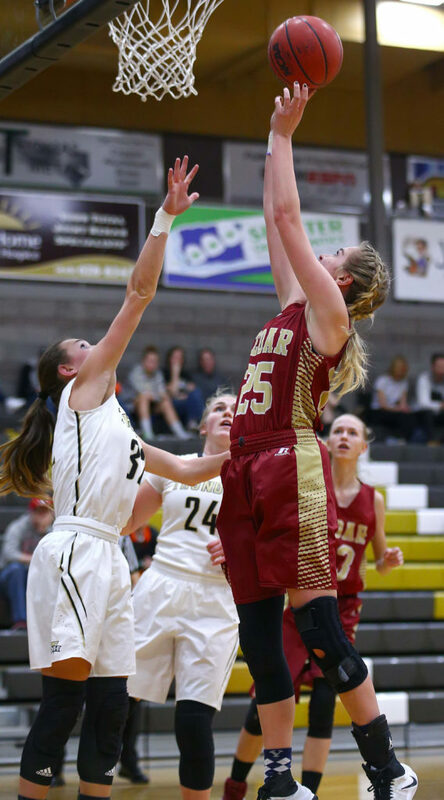 The Lady Flyers will host Desert Hills on Tuesday night. 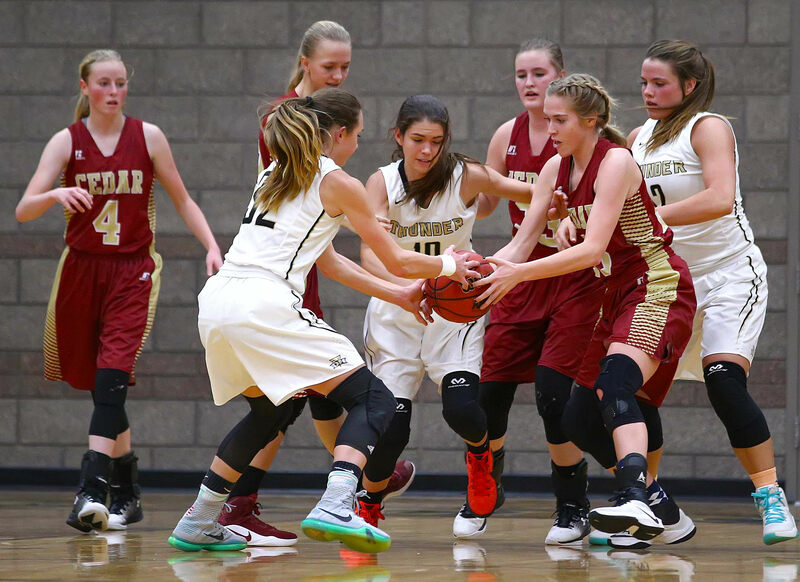 The Lady Warriors were the only team to win on the road in Region 9 on Thursday night. 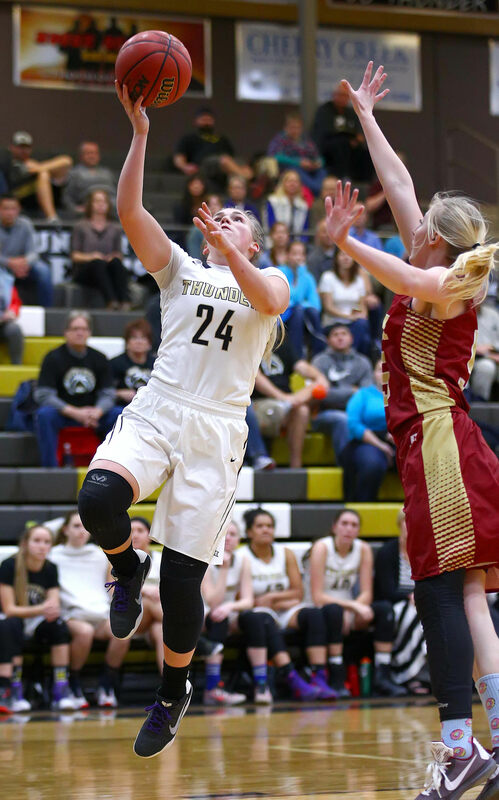 The Warriors jumped out to a 21-9 halftime lead and then played Pine View nearly even in the second half to pull out the win. 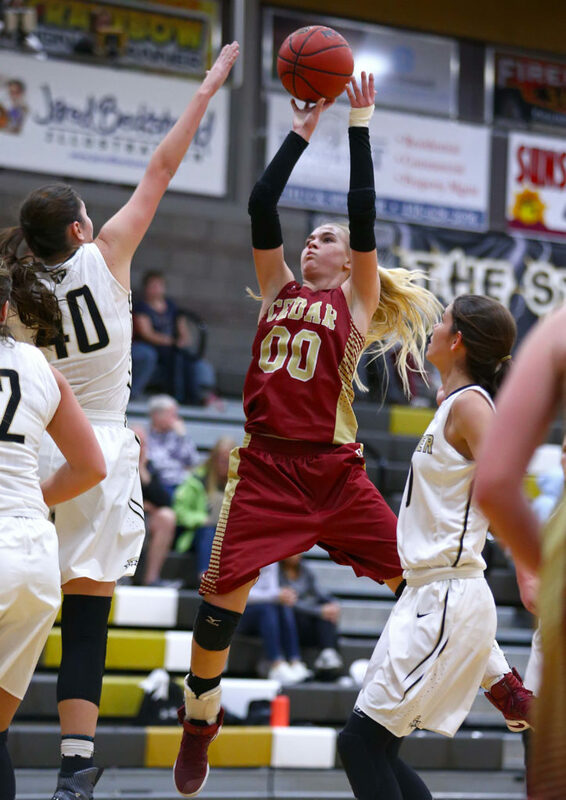 The Lady Panthers outscored Snow Canyon from the field 28-26. 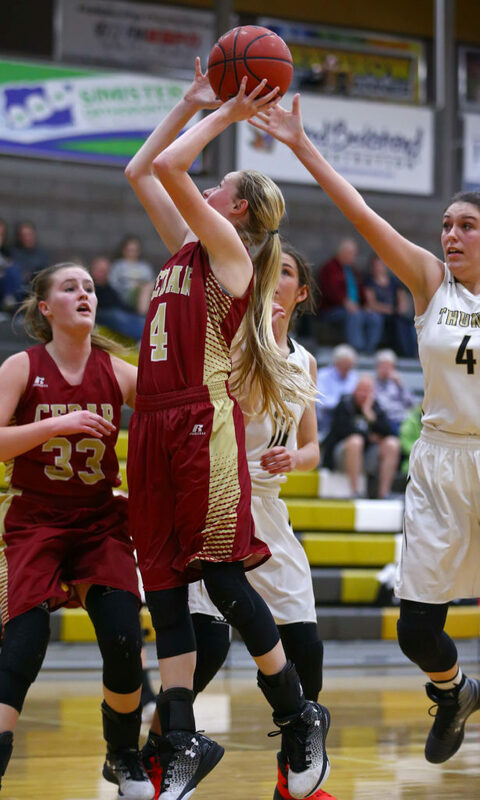 But the difference came at the line where the Lady Warriors shot 20 more free throws (38-18) and outscored Pine View 20-9. Melenaite Kata led the Lady Warriors for the second straight game in scoring with 14 points. Jasmine Lealao scored nine points. Lindsy McConnell had six. Olivia Harris led the team with seven rebounds. 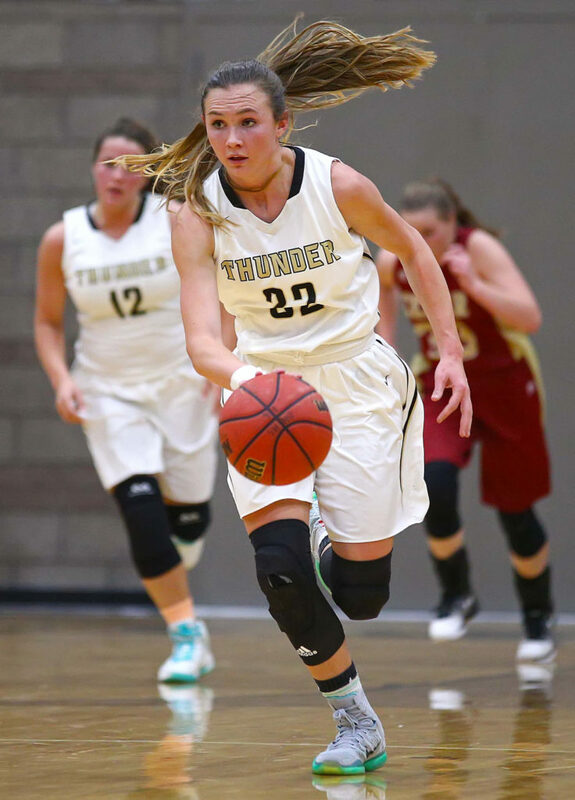 For Pine View, Maycee Hayes led the team with 15 points. Lei Tonga scored seven. Claire Newby led the team with 10 rebounds. Snow Canyon improves to 2-4 in region and 9-8 overall with the win. The Lady Warriors will host Cedar on Tuesday night. Pine View falls to 3-3 in Region 9 and 6-7 overall. The Lady Panthers will host Hurricane on Tuesday.